Science fiction writer Ursula K. Le Guin in 2005. Le Guin died on Monday (Jan. 22) at the age of 88. Writer Ursula K. Le Guin, whose work spanned multiple genres and categories including science fiction, fantasy, poetry and essays, died on Monday (Jan. 22) at the age of 88, the New York Times reports. The exact cause of death has not been announced, but Le Guin's son told the Times that his mother had been in poor health for months. Over a career that spanned more than five decades, Le Guin authored "seven books of poetry, twenty-two novels, over a hundred short stories (collected in eleven volumes), four collections of essays, twelve books for children, and four volumes of translation," according to her website. She is particularly well-known for her series of young adult fantasy books that take place in the world of Earthsea, as well as her science-fiction novel "The Left Hand of Darkness" (Ace Books, 1969), about the meeting of interplanetary cultures. Writer Ursula K. Le Guin was known for her science fiction and fantasy works, as well as her poetry and essays. Le Guin died on Jan. 22, 2018 at the age of 88. Other prominent authors including Salman Rushdie, David Mitchell, Neil Gaiman and Iain Banks have cited her as an influence on their work, according to the Science Fiction Writers of America (SFWA). Ann Leckie, author of "Ancillary Justice" (Orbit Books, 2013), told Space.com in 2013 that Le Guin influenced her writing as well. 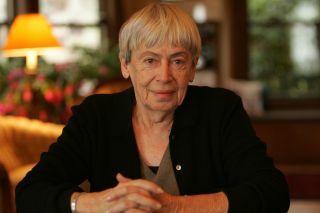 Le Guin earned a plethora of awards and honors during her writing career. In 1969, "The Left Hand of Darkness" won both the Hugo and the Nebula awards (which are considered the premier awards in that genre). She snagged both prizes again with her novel "The Dispossessed" (Harper & Row, 1974). Two more of her novels won the Nebula (most recently in 2008), for a total of four wins — more than any other author in that category. The National Book Foundation named her its 2014 Medalist for Distinguished Contribution to American Letters, and in 2017 she was voted into the American Academy of Arts and Letters. Le Guin's last book, published in December, was a collection of nonfiction essays titled, "No Time to Spare: Thinking About What Matters" (Houghton Mifflin Harcourt, 2017).